10 October. Veteran communist leaders Tokuda Kyuichi and Shiga Yoshio are at last free after spending 18 years in prison for their party activities – but not before they have briefed General MacArthur’s HQ on the Party’s post-war plans. They are among about 3,000 political prisoners released after the war on the orders of the occupation authorities. 11 October. Prime Minister Shidehara meets General MacArthur to introduce himself formally as the new premier of Japan. In response, MacArthur recommends constitutional revisions and reformation of Japanese social structure. 1 November. The Constitutional Problems Investigation Committee, established by the Shidehara cabinet and led by Matsumoto Jōji, is now given exclusive authority over constitutional issues. This follows criticism of Konoe Fumimaro’s role in the constitutional process. Since meeting with MacArthur on 4 October in his role as acting Minister of State, Konoe has been working on revisions. With the fall of the Higashikuni cabinet, he is also Lord of the Privy Council. Due to his involvement in wartime politics, however, his role in the constitutional revision has been criticized both in Japan and abroad. Even MacArthur now distances himself from Konoe, and GHQ denies giving him any endorsement to work on the constitutional revision. 6 November. Recognizing the important role they played in Japan’s war effort, General MacArthur orders that all 17 of Japan’s vertically integrated corporations dissolve their structures. This is the first antitrust law in Japan’s history. 13 October. Prime Minister Shidehara calls for an extraordinary cabinet meeting to discuss constitutional revision. He plans to establish a Constitutional Problems Investigation Committee under the leadership of Matsumoto Jōji. Its work parallels the constitutional revision efforts recently initiated by Konoe Fumimaro, former Minister of State and now Lord Keeper of the Privy Seal. 25 October. 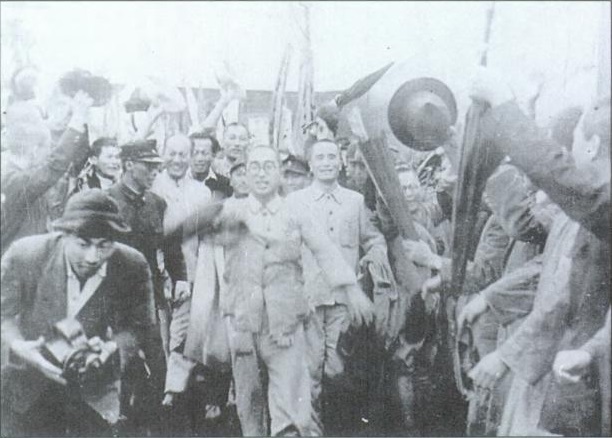 Chen I, newly appointed Garrison Commander and Chief Executive of Taiwan, receives Japan’s surrender and formally claims sovereignty over the province. This day comes to be commemorated as Taiwan Retrocession Day.